Valutech supplies replacement tube bundles for both heat exchangers and storage tanks manufactured from stainless Steel 316, copper and carbon steel tubes. 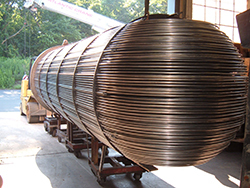 The tube bundles are manufactured to meet your exact requirements. We offer replacement tube bundles for S.A. Armstrong, Bell & Gossett, TACO, A.S. Leitch and American Standard heat exchangers among others.